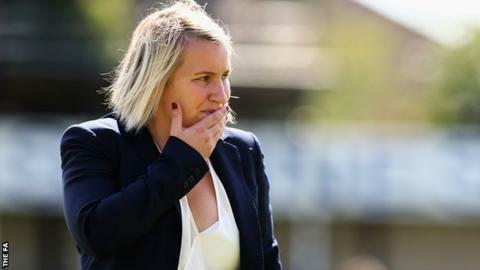 Chelsea Ladies boss Emma Hayes has insisted her side's immediate focus is on securing a top-two finish to qualify for the 2016-17 Champions League. Hayes's side are currently five points clear of Manchester City and Arsenal at the top of Women's Super League One. "We want to make the Champions League places first - that's the first goal," Hayes told BBC Sport. "If we win the next game, we'll qualify for that competition again next year. That's the priority, nothing else." Chelsea travel to 2014 champions Liverpool for their penultimate match of the season on 26 September. A win in either of their final two games would guarantee Chelsea a top-two finish, while six points would ensure a first league title. "If we manage to get a good result at Liverpool, then we can talk about winning the league," added Hayes. Second-placed City have a game in hand on their rivals and host Liverpool on Thursday.